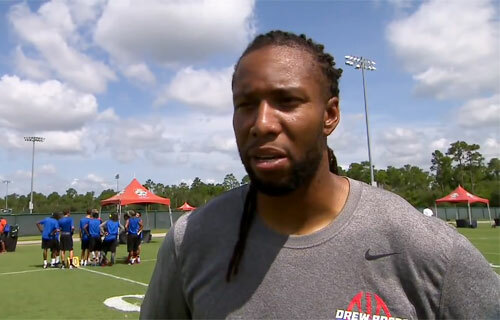 ORLANDO, Fla. — Join Drew Brees along with other NFL superstars Larry Fitzgerald, Patrick Peterson, Mark Ingram and more on June 25-27, 2015 at the ESPN Wide World of Sports Complex in Orlando, Florida powered by ProCamps. 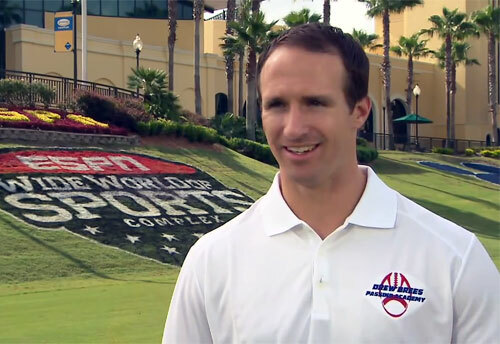 Founded in 2013, the Drew Brees Passing Academy & 7-on-7 tournament offers a competitive high school 7-on-7 competition and one-of-a-kind football camp for teams across the nation. For more info, click here. 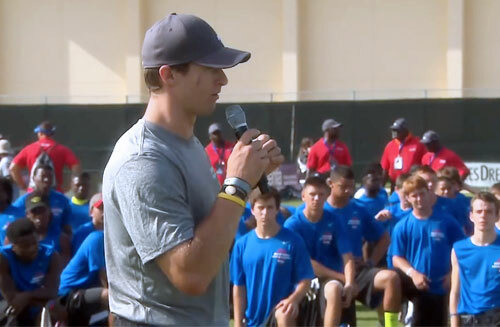 In June 2014, more than 300 high school athletes from across the country participated in the exclusive Drew Brees Passing Academy. These young athletes had the opportunity to learn from Brees and train with other NFL superstars such as Larry Fitzgerald (Arizona Cardinals), Darren Sproles (Philadelphia Eagles) and Darrelle Revis (New England Patriots). Participants were exposed to new training techniques for conditioning and performance, and then participated with team members in a two-day 7-on-7 Tournament. Proceeds from the Drew Brees Passing Academy and 7-on-7 Tournament benefit The Brees Dream Foundation, established in 2003 to help cancer patients with quality care and education for children and families. Each player will receive an elite apparel package. The winning team will receive a donation to the high school and its 2016 entry fee waived. Awards ceremony Winning team will receive a donation to the high school and its 2016 entry fee waived. The Brees Dream Foundation has contributed more than $20,000,000 to charitable causes and academic institutions globally. It is proud to be a reliable and accountable charity solution. The Foundation will continue to challenge itself and its corporate partners to increase the impact they have on the lives of those in need. Drew Brees is the current quarterback for the New Orleans Saints. He is a seven-time Pro Bowl selection, holds multiple NFL passing records, and led the Saints to a Super Bowl championship in 2010. Sports Speakers 360 is a booking agent for pro athletes. If you would like to book Drew Brees for a speaking engagement, appearance or endorsement, contact Drew Brees booking agent for fees at 1.855.303.5450.